Lionel Messi is an Argentine professional football player who plays for Spanish La Liga club, FC Barcelona and the Argentina national team. Messi has won the FIFA world’s best player of the year award a record of 5 times, 4 of which he won consecutively. He is also at the moment, Argentina’s all-time top scorer. Lionel Andrés “Leo” Messi was born on 24 June 1987 in Rosario, Santa Fe, Argentina. He was born into a middle-class family of Italian origins, with his dad, Jorge Messi working at a steel factory and his mum, Celia Cuccittini working at a magnet workshop. He has two brothers and a sister – Rodrigo, Matias and Maria Sol. Messi’s family are great lovers of football, igniting his deep passion for the game at a very tender age of 4. His greatest inspiration and fan at that time was his maternal grandmother who went with him to every game. Celia as she was called later died prior to Messi’s 11th birthday. You know how the Barca star is always making the sign of the cross and looking up to the sky during his goal celebration? That is a tribute to his beloved late grandmother. In addition to his grand-mum, Messi’s elder brothers, Rodrigo and Matias were also great sources of inspiration as they always played football with him. Moreover, his cousins and now professional footballers Maxi and Emanuel Cuccittini were also burning for the sport back then, and so played with him too. Messi’s football career has always been tied to his family. Even with his current fame, members of his family are still playing significant roles in his profession, His father is his agent, his eldest brother Rodrigo, his publicity and daily logistics manager, while his mum and immediate elder brother oversees the Leo Messi Foundation. Messi has so far, spent his entire professional football career at FC Barcelona. At 25, Messi had already netted 200 goals in La Liga, making him the youngest player to achieve such feat. He has also remained since 2012, the first player to score five goals in one match in the history of the Champions League. Where Was Messi Before He Came to Barca? Messi joined his first club, Rosario-based youth club, Newell’s Old Boys at the age of six. There he began setting records and making history scoring almost 500 goals in 6 seasons. However, his early career wasn’t entirely swift, the promising starlet, at the age of 10, was diagnosed with growth hormone deficiency which affected his growth giving him a smaller look compared to his peers. When his parent’s insurance expired and other Argentine clubs were unable to foot his medical bills, the family sought help abroad. First on their choice list was Barcelona as they had family in Catalonia. Fortunately, Charly Rexach, the first team director took an immediate interest in him. Barca signed the young Messi following an ultimatum issued by his family. The family moved to Barcelona in 2001 but the introverted Messi was soon left alone with his father and was often homesick after the rest of the family moved back to Rosario. Notwithstanding, the starlet quickly became outstanding in the youth team, the famous “Baby Dream Team” which included the likes of Cesc Fabregas and Gerard Pique. Lionel Messi made his first-team debut for the Catalan giants at the age of 16 in November 2003 as a substitute in a friendly match against FC Porto. His impressive performance led to the inking of his first professional contract in February 2004 which had a €80 million buyout clause. He also began training weekly with the first team side. His first senior team contract signed on his 18th birthday on 24 June 2005 increased his buyout clause to €150 million. Messi’s early days as a starter with Barcelona were more often than not truncated by injuries, but at the start of the 2008/2009 season, the winger looked to have established a perfect rhythm which he has not only sustained but developed by the year. That season, Messi lead Barcelona to its first ever treble victory (La Liga, Super Cup and Champions League) and also received first FIFA Balon d’Or World Player of The Year Award at the age of 22. The Award was previously held by his perceived rival Cristiano Ronaldo in 2008. His incredible performances for the next three seasons saw him bag the coveted award for a record of four consecutive times. After injuries marred his performance for two seasons, Ronaldo regained the award, (2013, 2014) Messi made the comeback in 2015 winning the award for the 5th time after leading Barcelona to a historic second treble victory. For the 2011/2012 season, Messi became Barcelona’s all-time highest goal scorer as well as the highest goal scorer in La Liga with over 300 goals. Messi has scored over 500 goals in his senior football career. The Argentine has been equally successful with his national side. He became the youngest Argentine player to score in the 2006 FIFA World Cup. Beginning from 2008, Messi has been Barcelona’s highest paid player. The club continues to award his unmatched performance and loyalty by increasing his salary exponentially. Messi boosts his base salary by winning bonuses and lucrative endorsement deals which also increase in value according to his performance. His annual base salary of $44.7 million which he began receiving in 2015, is the highest earned by any player in the sport. Lionel Messi’s incredible achievements in the world of football, as well as his numerous endorsement deals, have contributed to giving him estimated assets worth $280 million which only increases by the year, making him one of the richest footballers in the world. As of 2016 his base salary with Barcelona is $44.7 million excluding winning bonuses, making him the highest paid football player on the pitch by salary. In 2016, Forbes estimated his annual earnings from all endeavours to be $81.5 million making him the second highest-paid athlete in the world behind Ronaldo. $28 million of that came from his numerous endorsement deals which include Adidas Gatorade, Audemars Piguet, Huawei, EA, Tata Motors and Gillette. Among these, the most valuable is with longtime partners Adidas which pay him an average of $10 million annually. Of all Lionel Messi’s housing properties, only two are prominent – his two homes in Barcelona, Spain. 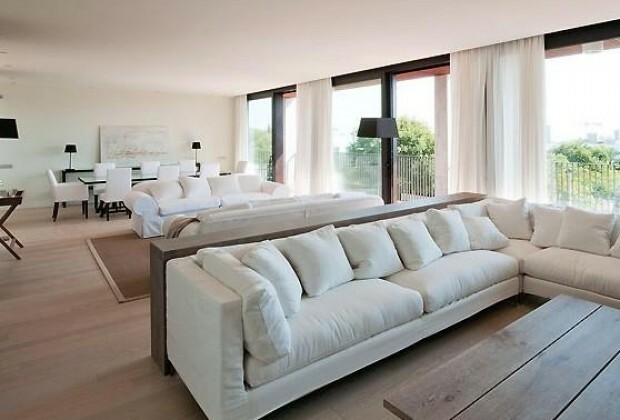 The first of Messi’s Barcelona homes is a lavish three-storey mansion with large glass windows. It is located in Castelldefels, one of the priciest neighbourhoods overlooking the Mediterranean sea. The house is very Eco-friendly, with green flowers and trees all around and rich grass covering every surface of its large compound. It also contains a well-equipped gym for the Barca star’s fitness sessions. Talking of the interior, the house is furnished to taste with cosy and luxury furniture, fixtures and home appliances. Messi’s second house in Barcelona is the most talked about. A gigantic round two-storey building designed like a football and built on a space that looks like a football pitch. The ‘pitch’ is divided into two equal halves, with one covered with grass and the other a large marble pool. The entrance takes the shape of the figure, ‘1’, while the main building is used to form a ‘0’, making up Messi’s jersey number, ’10’. Just like the first, it is also covered in rich greenery. It, however, appears the hungry eyes of the public are yet to pry into this magnificent creation. In July 2016, Messi and his father were both sentenced to 21 months in prison and ordered to pay fines of €1.7 million and €1.4 million respectively after being found guilty of tax evasion fraud. The tax evasion was related to sponsorship earnings from 2007 and 2009. Well, for a man who earns multi-millions annually, both fees combined looks like a chicken feed. Also, the duo didn’t serve time behind bars, thanks to Spanish laws which pardons first offences under two years. Lionel Messi is married to Antonella Roccuzzo. They wedded on 30th June 2017 at the famous Hotel City Centre in Rosario, Argentina. Also born in Rosario, Antonella has been Messi’s friend from childhood. The two, however, parted ways when Messi went abroad to focus on his football career. Antonella started dating another guy who later died in a car crash in 2007. On hearing news of the sad incident, Messi travelled to their hometown to console Anto and help her get over her grief. It was during this period that the two reunited. They, however, managed to keep their renewed relationship low and away from the media until sometime in 2009, when Messi publicly confirmed he’s got a girlfriend. Antonella Roccuzzo was born on 26th February 1988. She is a graduate of Latin American Education Centre, as well as Rosario National University. She currently owns a shoe line in partnership with Luis Suarez’ wife, Sofia Balbi. She also has a massive following of over 6 million on Instagram. 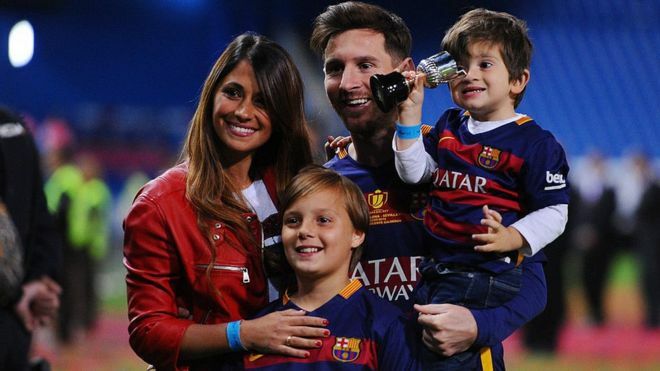 Antonella has two kids, with Messi – Thiago and Mateo Messi, both boys. Thiago Messi was born on 12th November 2012 in Barcelona, Spain. It is quite surprising to know that Thiago who is now five, calls his dad by his name – Leo Messi, just like everyone else. Messi revealed in a recent interview that his eldest son is yet to have a clear grasp of the link between his being a famous footballer and that of being his father. Messi’s second son, Mateo Messi followed on September 11, 2015, also in Barcelona. Meanwhile, Messi and Antonella are expecting their third child, also a boy.